The stiff-buttoned mouse doesn’t quite pass muster. The roomy, and relatively responsive Logitech MK320 keyboard isn’t bad as far as cheap keyboard bundles go, but it’s saddled with a so-so mouse. On sale for as little as $25 on Amazon (its list price is $40), the MK320 benefits from dead-simple wireless setup and snappy typing, but the stiff buttons on the mouse make clicking a drag. Given that Logitech offers better options at slightly higher and lower price points, bargain hunters can safely give the MK320 a miss. Measuring 17.5 x 7 x 0.5 inches and weighing about 1.3 pound pounds, the MK320 feels roomy but a bit cheap and bendy, unsurprising given its bargain price. A curved plastic lip at the bottom of the keyboard serves as a smallish palm rest, while a pair of retractable feet in back can prop the keyboard up at an 8-degree angle. Above the main keypad sits a series of hotkeys that serve up media playback and volume controls, along with one-touch access to email, music, Task View, your browser’s homepage, and your desktop. Four more hotkeys for Search, Lock, Explorer and Power share space with the F5, F6, F7 and F8 keys, and a dedicated Calculator button lies just above the numeric keypad. Of the 18 total hotkeys, 10 are programmable using the aging Logitech SetPoint app. (You’ll have to upgrade to a newer keyboard to use the slick Logitech Options utility). Among the possibilities for remapping the hotkeys include launching a program, opening a webpage, switching apps or assigning a keystroke. As with other Logitech keyboards we’ve tested, the MK320 and its bundled mouse connects via a single 2.4GHz USB dongle that doesn’t require any drivers—just plug it in to your PC’s USB port and you’re good to go. The MK320’s wireless connection was rock-solid throughout my testing, and both the keyboard and mouse reconnected quickly after going to sleep following periods of inactivity. The MK320 is designed to work with Windows machines only. While you can connect the MK320 to a Mac, doing so means you won’t be able to customize any of the hotkeys. The molded keys on the MK320 feel...well, not amazing, but good enough considering the bundle’s bargain price. While the slightly concave keys feel hollow and cheap, the MK320’s typing acting is relatively snappy, with decent travel, a solid, satisfying bump at mid-keystroke and a springy rebound. Keyboard noise is moderate. And because of the sculpted design of the keys, my fingertips rarely had any trouble finding their way. The 2.7-ounce mouse that accompanies the MK320 is more of a mixed bag. Starting with the positives, I liked the weight of the ambidextrous mouse (model number M215) and appreciated the smooth, buttery bumpiness of its scroll wheel. On the other hand, I felt the mouse buttons took a little too much pressure to push, which made clicking feel like a chore while putting unneeded strain on my finger tendons. Personally, I preferred the mouse that comes in the slightly pricier Logitech MK520 bundle, which boasts the same pleasing heft but buttons that respond to considerably less pressure. There’s also a lighter mouse in Logitech’s cheaper MK270 package ($20 online) that’s easier on the fingers. Turning back to the M215 mouse with the MK320, its middle button can be programmed with scores of alternate functions, from switching apps and flipping documents to launching programs and showing the desktop, using the Logitech SetPoint app. Unfortunately (and unlike the mouse included with the MK520 keyboard), the M215 mouse isn’t compatible with Logitech’s newer Options utility, a nifty tool that lets you map dozens of Windows functions to your mouse gestures. 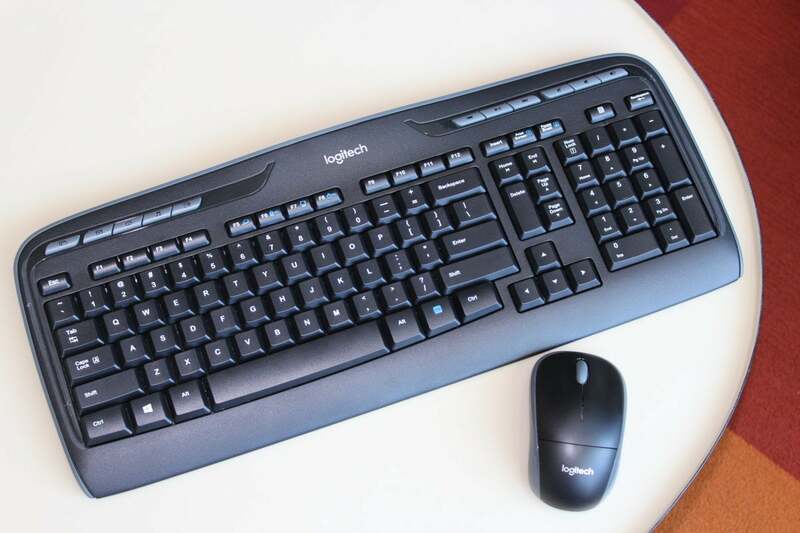 The Logitech MK320 keyboard feels fine and boasts solid wireless connectivity plus programmable keys for a bargain price, but its included, stiff-buttoned mouse doesn’t quite pass muster.